Los Angeles Unified school teachers have voted to give the leaders of their union the power to call a strike if further talks with the district fail to produce an acceptable deal. Officials in the union, United Teachers Los Angeles, announced the results of the weeklong strike vote on Friday. Of the more than 80 percent of union members who cast ballots, 98 percent of teachers voted in favor of authorizing a strike. It's the first time since 2009 that rank-and-file UTLA members have voted to authorize a strike. If the teachers acted on the threat, it would be their first strike since 1989. But weeks or months could still pass before UTLA leaders actually call for a walkout. Legally, the union cannot call a strike until the conclusion of a lengthy dispute-resolution process with state-appointed officials. The first step is mediation, which does not begin until Sept. 27. "I think it's time to take next steps," said union Vice President Cecily Myaert-Cruz. "I won't tip my hand to things planned, but take notice ... The fight continues and we're a fighting union." LAUSD teachers have been working without a contract for more than a year. 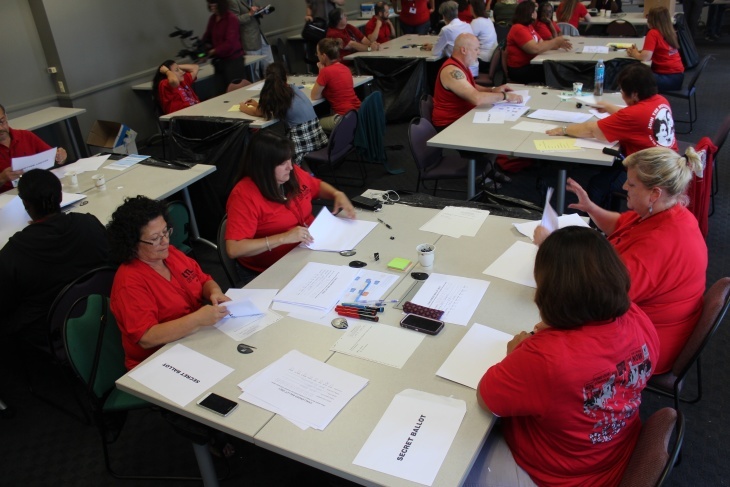 Nearly a year and a half of talks between the district and UTLA leaders recently failed. In a statement, district officials said that "L.A. Unified remains opposed to a strike and stands with students, families, and employees to ensure learning and safety come first ... Students and families will bear the brunt of a strike." For more on how the two sides got to this point, check out this post we put together, which explains the impasse in detail. 6:21 p.m.: This article was updated with a quote from the union vice president and the LAUSD statement. This story originally published at 5:29 p.m.